“A Alien or Sutin 👽” is now on Youtube! I made the amazing video using the great Windows Movie Maker (it’s free software and really easy to learn). I made the images using Gimp of course. Altogether, it took 2 hours to make the video (I think the song took 3 hours to make – but I did it over a month). The next song coming in my album (“Flower Power Rangers”) will be called “Jazz Hands” (I’m working on it now). As you can probably tell, the song will be jazz. Also, I have a brand new keyboard! If you have Mozilla Firefox, read on, if you don’t, then get it, it is the best browser. It has lots of extensions called Add-ons such as Adblock Plus, Flashblock, Tree Style Tab and many more. Adblock is so good at blocking adverts, I have never seen a single advert on this computer and all the computers I use have something that blocks adverts. Personas decorate the top and bottom of your browser window. I have made two personas, check them out. I used Gimp to make the mini narwhal persona and I copied my banner (look at the top of the screen) to make the jeevanslife persona. It’s really easy to add your own personas once you have created them (as long as they are the right size). I think I will create more soon. In 2010, there were 18 new posts, not bad for the first year! There were 45 pictures uploaded, taking up a total of 4mb. That’s about 4 pictures per month. The busiest day of the year was September 10th with 438 views. The most popular post that day was About Jeevan (aged 8). The top referring sites in 2010 were reddit.com, hyperactivejai.wordpress.com, WordPress Dashboard, itaunewsinfo.com, and onlineeducationcollege.info. Some visitors came searching, mostly for lbp2, lbp 2, moshi monsters moshlings, jeevanslife, and moshlings. On Moshi Monsters I am a member and I have 9 Moshlings, they are: Professor Perplex, Snookums, Doris, Pooky, Lady Googoo, Big Bad Bill, Ecto, Kissy and Squidge! I am a Super Moshi as well because I am a Member and that is how I got Lady Googoo. I’m called 31415927 (I am named after pi). Big Bad Bill (VooDoo guy) >> Yellow Love + Black Star + Blue Star. Ecto (ghost) >> Red Love + Black Love + Any Pepper. 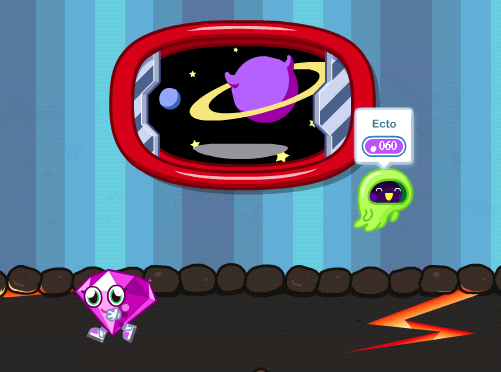 Pooky (Dinosaur) >> Red moon + Purple Magic + Red magic. Doris (Rhinosaurus) >> 3 Moons but one has to be black. Kissy (baby ghost) >> Purple Star + Yellow Star + Black Magic. Chop Chop (monkey) >> 3 Dragons. Gingersnap (beat up cat) >> Magic + Love + Pepper. Squidge (a fluffy flying thing) >> Star + Pepper + Dragon. Snookums (Dinosaur) >> 3 Star. Dj Quack (duck) >> Dragon + Moon + Star. Stanley (seahorse) >> 2 Love Berries + 1 Dragon Fruit. Purdy (pink fluffy cat) >> Dragon + Moon + Dragon. Remember Club Penguin? Probably not. That’s so “last couple of months” ago. You see, me and my friends all play Moshi Monsters now. And anyway, did I tell you that I hate Club Penguin? Oh yes, I did. 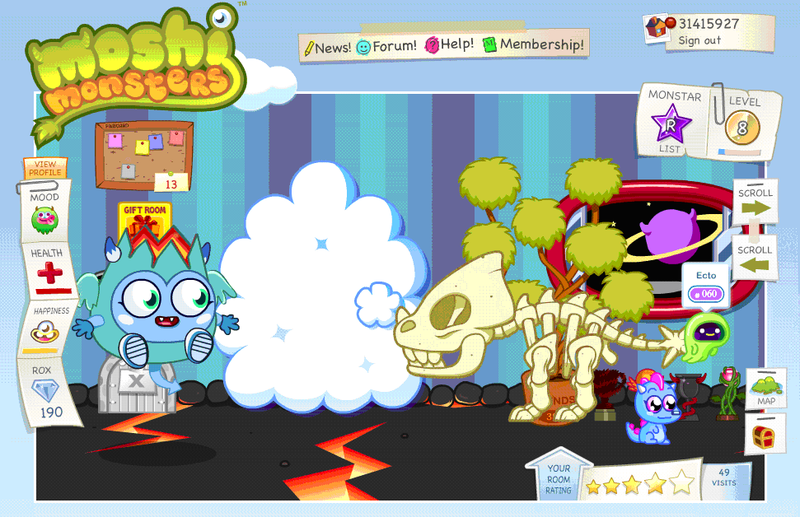 Moshi Monsters is a website a little bit like Club Penguin but you can do so much more for free. The best thing is that you don’t have to pay money (Rox in Moshi Island) for pets. But you must pay Rox to grow plants to attract pets (called Moshlings). And you get Rox by doing puzzles and some mini games. So you can play loads without paying any real money. So it really has taken over Club Penguin as more people keep joining it. Another really great thing is the number of mini games you can play in the Moshi Fun Park. These are similar to games in Miniclip. My favourite ones are SolipsKier and Little Master Cricket. You really should try Moshi Monsters. Thank you and welcome to all the people that visited my blog from reddit. My Dad made a post on reddit this morning. I was amazed and very happy when I saw how many people had seen my blog (nearly 300 right now). My previous highest was 57 when my aunty told everyone at her work. I’m not allowed to go on reddit myself as Dad says it’s a grownups’ site. Thank you and please visit again.